First-in-the-nation land access bill for young and beginning farmers signed by Governor Dayton – bipartisan and agricultural groups supporting. SAINT PAUL, MN (May 30, 2017) – On Tuesday evening, Governor Mark Dayton signed ten budget bills that included a first-of-its-kind beginning farmer tax credit. Authored by Rep. Nels Pierson (R-Rochester) and Sen. Mike Goggin (R-Redwing), the bill supports the transition of land to young and beginning farmers through a tax credit incentive. Through the bill, landowners receive a state income tax credit when they sell or rent land or agricultural assets to a beginning farmer. The credit equals five percent of the sale price or ten percent of the cash rent, or fifteen percent for a cash share agreement. In turn, the beginning farmer must take a farm management course to qualify for the tax incentive and would be eligible for a tax credit covering the full cost of training. The tax credit is effective in the 2018 tax year and is funded at 12 million dollars for the 2020-2021 biennium. The funds are available on a firstcome-first-served basis. Finally, the sunset for the credit is 2023 with the Rural Finance Authority issuing a report on the effectiveness of the credit no later than Feb. 1, 2022. The bill had bi-partisan support: House File 608 was co-authored by Representatives Jason Rarick (R-Pine City), Josh Heintzeman (R-Baxter), Mary Franson (R-Alexandria), Greg Davids (R-Preston), Jeanne Poppe (DFL-Austin), Gene Pelowski (DFL-Winona), Clark Johnson (DFL-North Mankato) and David Bly (DFL-Northfield). 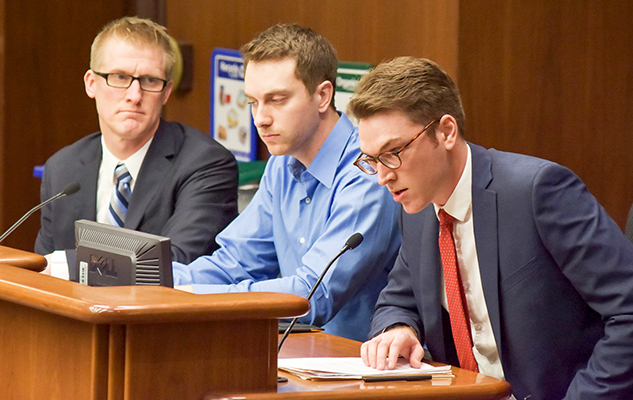 In the Senate, the bill (SF 1414) was chief authored by Sen. Michael Goggin (R-Redwing) and co-authored by Senators Andrew Mathews (R-Milaca), Rich Draheim (R-Madison Lake), Kent Eken (DFL-Twin Valley) and Dan Sparks (DFL-Austin). Additionally, the Central Minnesota Young Farmers Coalition worked with major agricultural groups that included: Minnesota Farm Bureau, Minnesota Farmers Union, Land Stewardship Project, and the Minnesota Catholic Conference. Founded in 2016, the Central Minnesota Young Farmers Coalition is a membership organization of farmers from Benton, Grant, Sterns, Meeker, Milaca, McLeod, Wright, Carver, and Rice counties. A local chapter of the National Young Farmers Coalition, the group meets regularly to socialize, network, and advocate for young and beginning farmers.